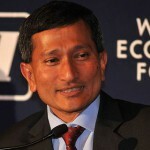 Dr. Vivian Balakrishnan has been a Member of Parliament since 2001. He is currently the Minister for the Environment and Water Resources. He previously held appointments as the Minister for Community Development, Youth and Sports, Second Minister for Trade and Industry, Minister responsible for Entrepreneurship, Second Minister for Information, Communications and the Arts and Minister of State for National Development.